This is the last of the salads that I had made for the barbecue party. Now this doesn't mean that there won't be more salad recipes and posts, because there will. With the summer heat and humidity already upon us, I am going to switch from warm hearty meals to some cool, fresh and soothing salads. Stay tuned. This cucumber salad is very simple to make and the dill leaves add a lovely flavor to the yogurt. I used a little cream to add the creamy factor to this salad, so feel free to either leave it out completely or vary the quantities to your liking. Salads are very forgiving. You don't have to stick to quantities and at times, even an ingredient list. So, go ahead, put your spin on it, and let me know how it worked out for you. Beat the yogurt, mayonnaise and cream together and add salt to taste. 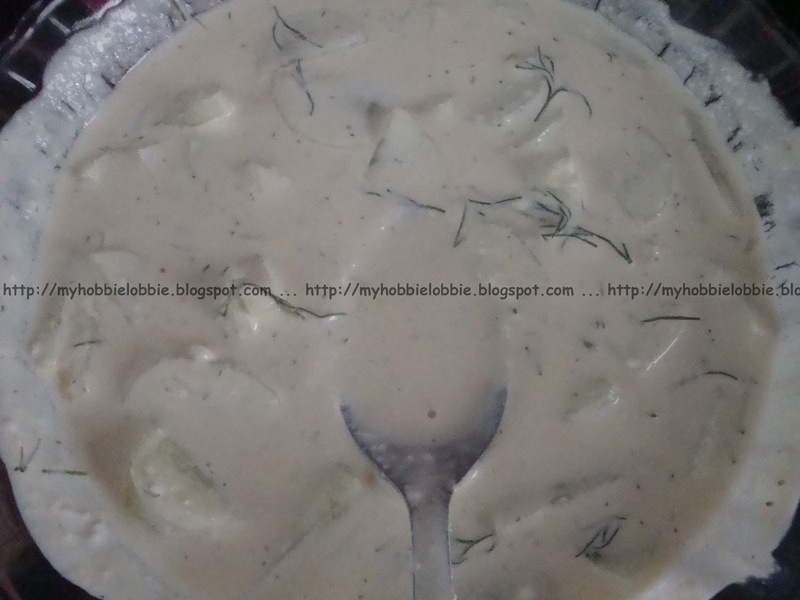 Tip in the sliced cucumbers and the dill leaves. This looks delicious! I love the dill/cucumber combo!